The horrifying moment a one-eyed bullfighter was charged and scalped by an angry bull was caught on camera, and it’s stomach-churning to watch. 45-year-old Juan Jose Padilla has already gone through the ordeal of being gorged by a bull in the past, and last week he was attacked again. The bullfighter was left with one eye after a bull attacked him in 2011, but his bullfighting injuries increased when he was left scalped in front of a large crowd in northern Spain last week. The gruesome footage was caught on camera. Padilla was taunting the bull when he lost his balance and the animal took its opportunity, charging at the man. Other people in the ring ran to try and distract the bull, but they weren’t able to stop the animal from ramming it’s horns into the man’s head, rolling him over and tearing at his scalp. 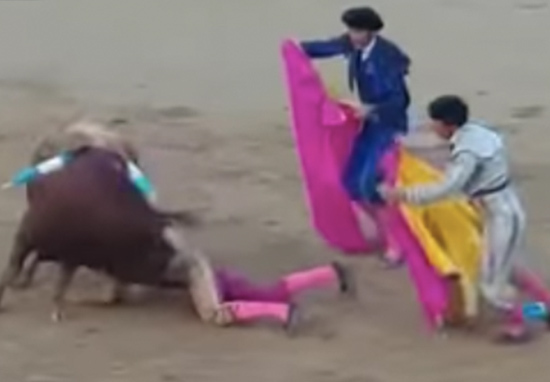 In the footage, Padilla can be seen trying to hold his head together while another bullfighter manages to momentarily block the bull with his muleta – the cloth. 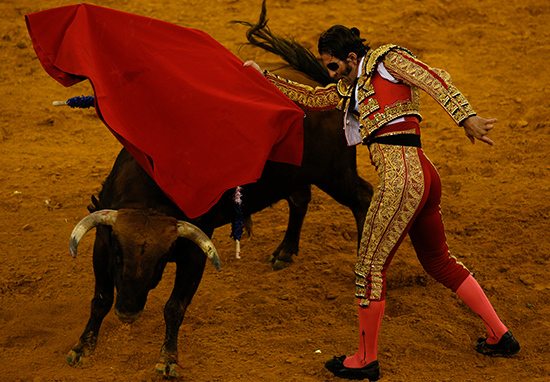 The bull became distracted by the other bullfighters, allowing Padilla to make his escape. Padilla was immediately taken to hospital, where doctors confirmed the bullfighter had not suffered any brain damage from the animal, but said he was lucky to be alive. Throughout the ordeal, the matador managed to stay conscious, while he received nearly 40 stitches in his head. He was transferred to Seville, where he continued his recovery with the same doctor who’s been treating him since his eye injury in 2011, Dr Alberto García-Perla. Many thanks to all the followers of the page for their love and demonstrated support. I am very well and I want to reassure everyone that my condition after the accident is favourable because I feel very well. Now I’m in Seville and I’m waiting for Dr. García-Perla to take care of me, who’s going to check my wound, explore it again and he will advise me how to continue with the recovery. I have been overwhelmed by so many expressions of affection, respect and encouragement as much towards me as my family did, and I want to thank all those who have been able to recover from the mishap suffered on Saturday in Arévalo. According to the Daily Mail, the bullfighter is still hoping to make the San Fermin festival in Pamplona – a festival which involves people gathering to run away from bulls who’ve been let loose on the streets. For the sake of the bulls as well as the guys getting their heads ripped open, maybe it’s time we stopped this ‘sport’.